Earlier this year, ahead of President Obama’s trip to Berlin for the Obama Foundation’s first international event, I wrote an email to let people know that the Foundation will be actively involved in supporting young leaders around the world as they seek to improve their communities and create change at a local, national, and global level. Giovanni Anzola-Pardo, Director of International Affairs at La Salle University in Bogotá, Colombia read my email and wrote to me about it. 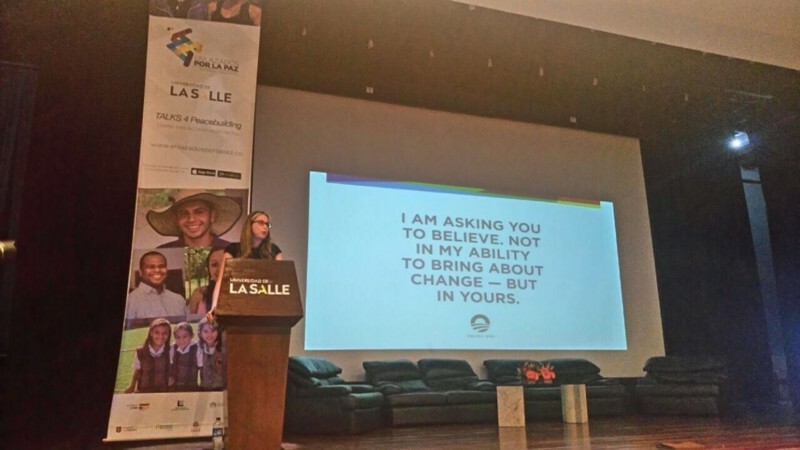 As one of the organizers of a summit on peacebuilding, Giovanni was working with seven universities, the Government of Colombia, and a number of organizations to gather thousands of students together to discuss how students and universities can contribute to the Colombian peace process and help consolidate a lasting peace in a country emerging from one of the longest armed conflicts in the world. He invited me to travel to Colombia to share more about the Foundation’s work and our efforts to help young people make an impact in their communities. Helping young people take on big issues is what the Obama Foundation is all about, so I happily accepted his invitation. I was thrilled to return to Colombia; I lived there for two years when I worked as a Vice Consul at the U.S. Embassy in Bogotá more than a decade ago. Yesterday, I spoke to hundreds of students about the lessons I’ve learned during my 13 years as a Foreign Service Officer for the Department of State. My point of view comes from being a diplomat negotiating agreements between adversaries and then working to ensure their successful implementation. Through these experiences, I have come to learn that while civil conflict and peace are local at their core, there are general lessons we can learn from the experiences of others. Lasting peace is not just the work of governments.Yes, governments handle the negotiations and sign the agreements (and often get the credit), but the true key to success is in the hands of the citizens. This is an incredible power to have, and should not be wasted. President Obama said earlier this year that “ordinary people, when working together, can do extraordinary things.” You don’t have to be an expert to make a lasting difference — you just need to commit to taking action. Treating others with dignity and respect — even when we disagree — matters.Treating someone with dignity and respect does not mean you agree with them, their actions, or their positions. But if you don’t treat the other side as human, they will remain a faceless adversary, and it is much easier to dig in to hardline positions or revert to violence. Talking respectfully with a former enemy is incredibly difficult, but it is necessary to pursue and sustain peace. There are many different paths to peace, and many ways for people to become agents of change — no matter your experience or commitment level.You may think there is no role for a university student in peacebuilding. It may seem like peacebuilding is better left to more experienced people. But just remember, if these “more experienced people” were experts in peace, there would not have been conflict in the first place. There is a role for everyone in this process — no matter their level of experience or skillset. Be bold, think big, take risks, and seek to change to the world — in whatever way is meaningful to you. Commit to community service.Find organizations that are actively involved in supporting peace, and volunteer your time and share your skills. Organize events that bring stakeholders from around the country together to make connections, share resources, and learn from each other. Apathy is destructive.This is your future. Don’t let previous generations decide what your future will be simply because you don’t care enough to be involved. Women are key to peace.Do everything in your power to create a safe environment for them to participate. You cannot succeed if half of your population is marginalized. Focus on sustainability and do not be discouraged.Fighting is often easier than making peace. Sustaining peace is often harder than signing a peace accord. Expect setbacks. Remain committed. As President Obama says, “hard things are hard”. In an age of instant gratification, do not give up when problems aren’t solved immediately. Young people today are the holders of hope. That was evident in Colombia when I spoke with students who were eager to make a contribution to the peace process. It is up to each of us to make choices to become active citizens in our communities, and to make positive and lasting contributions to these efforts. 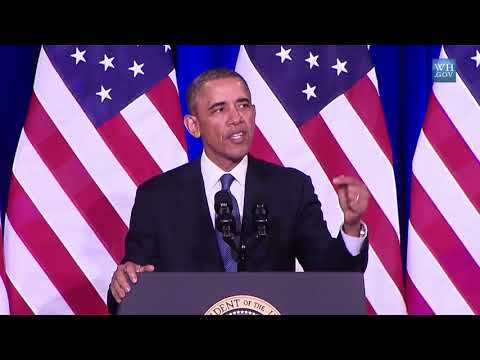 The Obama Foundation seeks to create pathways and knock down barriers for people working on issues that have been important to the Obamas, including promoting inter-communal dialogue and conflict resolution like what is occurring in Colombia. President Obama is right when he says that that when we work together, we can achieve extraordinary things. We want to hear more stories from people like Giovanni about individuals and organizations making a positive impact in their communities — and suggestions about how we can help — we’re listening.